Music in the toddler and preschool classrooms can sometimes be taken for granted or easily overlooked. Children are intrinsically motivated to sing, dance and explore with musical instruments when given the opportunity. Music and movement go together like peanut butter and jelly! When creating a music play space, don’t forget to include movement opportunities, too. 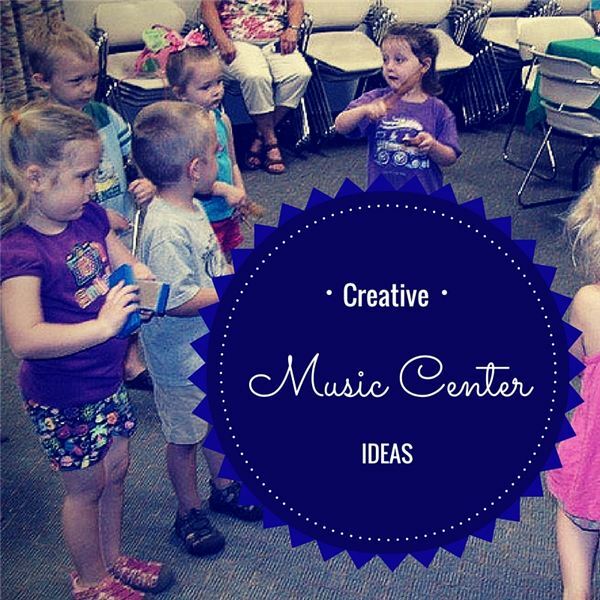 Here is a list of fun and creative ways to incorporate music and movement into your music center. Your music center will be busy and noisy! Find a space in the room that will be large enough to allow jumping, dancing and twirling. Remember to include soft furniture (if any at all) rather than traditional chairs and/or tables to prevent bumps and bruises. A carpet on the floor works well as a visual reminder of where the musical play should take place. In addition, a music center needs to be located away from more “quiet" areas such as the library or listening center. Near the dramatic play or block center tends to work better as these places are usually the louder places in the room. Hanging pillows on the wall can absorb some of the sound. Provide a wide variety of musical instruments to allow exploration with sound, rhythm and tempo. Have doubles of some instruments for children to pair up and engage in social interactions and cooperative play. Traditional- rhythm sticks, bells, drums and cymbals are some common instruments children enjoy experimenting with. Add some unique instruments such as cowbells, a banjo or a keyboard to encourage new sounds and creative play. Incorporating instruments from cultures around the world (maracas, rain sticks, shekeres or shell rattles) helps to encourage independent exploration with new and interesting instruments. Homemade- many simple instruments can be made either for or by the children. Maracas made from plastic eggs and plastic spoons are easy and fun. Just fill a plastic Easter egg with beans or rice, place between two plastic spoons, and wrap a rubber band around them to hold it all together. Another easy one is decorating two paper plates, adding beans or rice (or the like) to the center, and stapling them together for another type of maraca. Homemade drums can be made by washing out various sized aluminum cans (coffee, soup, etc.) and placing them upside down all together. Take a strong, thick rubber band and wrap around all of the cans, with the bottom side up. Use a wooden dowel or a pencil to hit the cans and compare the different sizes with the different sounds! Guess this Sound. Put a divider up between two chairs. Have one child play an instrument and another child must guess what instrument it is. Musical Bingo. A twist on the traditional bingo game. Make a simple bingo game card with pictures of different instruments in the squares. Using a pre-recorded CD or hidden behind a barrier, play an instrument for a few seconds and have the children cover their picture of what instrument they are hearing. Concert Theatre. Create a stage for children to show off their skills! Make tickets, provide dress-up materials, microphones and arrange chairs for the audience. Copycat. Choose one instrument from an arrangement and have a child copy you. Then choose two instruments for the child to copy, and so on. Remember, all children learn through play and exploration. This includes music! Providing a variety of instruments to encourage independent play and supporting movement opportunities allow children to have success with experimenting with sound and body awareness. Don’t forget to change materials regularly to keep things new and interesting. Kemple, K. M., Batey, J. J., Hartle, L. C. (2004). Music Play: Creating Centers for Musical Play and Exploration. Young Children.